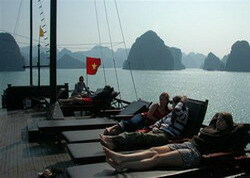 Consist group of over 09 junk boats offering daily and overnight on boat cruise to visit Halong bay. 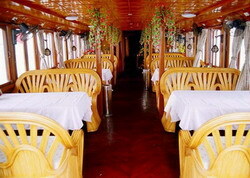 We are not only sell daily joining group seats for tourists but also for lease private Junks. If you and group would like to have private junks, please choose one of our junks below and tell us your itinerary, we will make up good price for you with high quality of our services. There are several Junks with different number of cabins on boats. 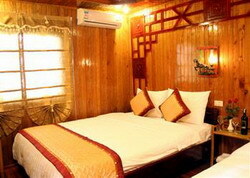 Cabin Facilities: All Junk boats have double or twin bedded cabins with AC, TV. Private ensuite bathroom and proper toilet facilities with hot & cold shower. Cabin size is 10m2. General Facilities: Indoor restaurant with excellent cuisine, fresh seafood. Video recorder, Stereo system, Mobile phone and VHF system. 35 KVA e-generators are set up on boats. Kayak service. Services: Staff are enthusiasm and professional. Very skillful in food preparation.